These articles present editorials from leading Japanese newspapers (Asahi, Sankei, Nikkei, Mainichi, Yomiuri) covering the same theme. The Nikkei：What preparations should be made for sudden eruptions? The Yomiuri Shimbun：Is there any way to detect signs of abnormality in volcanic activity? On January 23, 2018, there was an eruption of the Moto-Shirane peak of Mt. Kusatsu-Shirane, located in Kusatsu, Gunma. At a nearby ski resort, one Japan Self-Defense Forces member died, with eleven other people injured in the eruption. The last time there were deaths in Japan due to a volcanic eruption was in 2014, when 58 people died after the eruption of Mt. Ontake on the border of Nagano and Gifu. The Japan Meteorological Agency lists 111 active volcanoes in Japan. Mt. Kusatsu-Shirane is one of 50 “Continuously Monitored Volcanoes” which are subject to 24-hour monitoring. 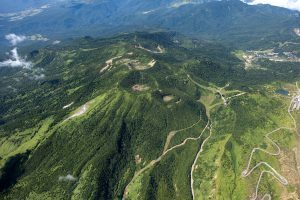 However, the JMA was focusing on monitoring the Shirane peak, and there was no camera monitoring the Moto-Shirane peak two kilometers to the south that erupted this time. The Town of Kusatsu provided information on the eruption immediately afterwards, but it took time for the JMA to confirm, and they were unable to send out an immediate warning to people in the area about the eruption. Four of the national dailies (excluding the Sankei) covered this deadly eruption in their editorials, calling for local governments and related organizations to improve their monitoring systems and create evacuation plans in order to prepare for sudden eruptions. With current volcanology, it is extremely difficult to predict relatively minor eruptions, but after the eruption of Mt. Ontake, the Act on Special Measures Concerning Active Volcanoes was amended, obligating local governments and tourism facilities in the 49 areas at risk from volcanoes throughout Japan to make evacuation plans for visitors and residents. The Asahi (January 27) remarked that “only one-third or so of the 155 municipalities that are home to volcanoes under constant monitoring have crafted emergency evacuation plans. Municipalities that have yet to take action should do so quickly as evacuation plans are fundamental elements to any emergency response.” The paper also noted a major issue of “Many local governments trying to mitigate damage from volcanic disasters lament the dearth of expertise on the issue,” with Japan having very limited numbers of volcano researchers and experts despite the number of volcanoes in the country. The Asahi declared, “In the aftermath of the devastating eruption of Mount Ontakesan, the government stepped up policy efforts to develop the human resources. Steady funding is needed to expand the pool of experts at universities and research institutes. The Mainichi (January 25), while mentioning that the local governments involved have limited budgets, argued, “Local bodies and related organizations need to prepare for sudden eruptions and make an effort to boost monitoring systems and formulate evacuation plans.” Stating, “Officials must take a renewed look at their monitoring and warning system, placing priority on ensuring the safety of people on the mountain,” the paper called for measures such as increasing the number of cameras for monitoring volcanoes. *English translations of The Yomiuri, The Asahi and The Mainichi are from The Japan News, The Asia & Japan Watch and The Mainichi, respectively. Those for The Nikkei is provisional. The content of this page was made by the Foreign Press Center Japan and does not reflect the opinion of the Japanese Government or any other organization.